Cara's Weight Loss Journal: did I mention that I LOVE the olympics??? Well, WI wasn't that spectacular, but at least it was a loss. I'm now officially falling behind on my own challenge. That's okay. I'm going to kick it in gear this week and hopefully have a great loss next weekend. Okay, as you guys have probably already guessed, I LOVE the Olympics. Especially the summer Olympics. And wasn't that opening ceremony amazing??!! It was absolutely HUGE! 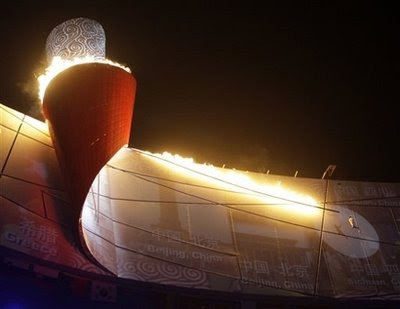 And the lighting of the torch was just spectacular. 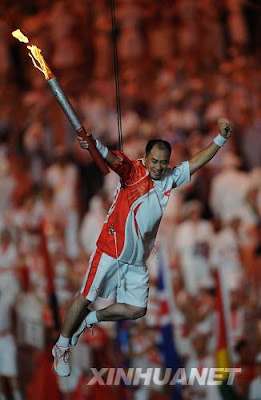 This guy, Li Ning, who was a former Chinese gymnastics gold medalist, lifts right up off the ground on these hidden wires and is lifted up to the very top of the Bird's Nest and he "runs" for a little over a quarter mile across the brim of the stadium while pictures of past Olympic great moments are shown on the screen. I thought he was going to fall at one point because he had to release his wires to allow him to be able to run on the side of the screen. He goes all the way around, running in slow motion (feet never touching the screen) until he makes it to the huge torch and lights it. WOW! But that wasn't what I wanted to talk about. We had first planned on having an Olympic Opening Ceremony party at our house but we just couldn't get our act in gear enough to do it. 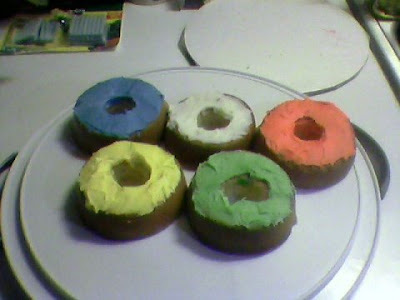 We had planned on making an Olympic rings cake and I was really looking forward to doing it, but our plans changed so we didn't do it. But when I got home from work Friday night, the house smelled like cake. Mmmm. My daughter had surprised me and made the cake! It was the cutest thing. She'd stopped at Joann's and bought some small little 3" cake pans and made the 6 rings using these pans then she cut out the centers of the cakes and iced them with the 6 different colors of the rings. What a kid!!! Here's what it turned out looking like. Katschi (tues WI) - Lost 1.6 pounds last week. MaryFran (tues WI)- Lost 2.6 pounds last week. Karyn (mon WI)- Lost .6 pound. Donna (mon WI)- Gained 1 pound last week. Spunkysuzi (sun WI)- Lost 1.6 pounds. Cathy (fri WI) - Lost 3.8 pounds last week. SO CUTE and so creative. I love the olympics as well. I usually don't even have the tv on when I'm in the house. With the olympics on, the tv is on constantly and I've actually even laid on the sofa watching some of the events! :-) LOVE LOVE LOVE them! Cara....you have my WI as Wednesday. it is Monday. I lost 6/10th this week. Full report is on my blog. What a blessing to have a daughter who will do something like that for you! I'm down 1.2 lbs this week for a total of 5.4 lbs! And now...the cake your daughter made is wonderful! What a great daughter you have! I'm giving you a kick in the rear to get yourself going for the week *g*! You can't lose your own challenge, Cara! Ride that bike like YOU'RE an Olympian!